How is a Rocket like a Guitar? Guitars and rockets have a lot in common, but what's good for a musician might spell trouble for an astronaut. October 21, 2005: When the space shuttle lifts off its pad at Kennedy Space Center, the roar is unbelievable. Even miles away onlookers grab their seats and hold on tight. Sound waves penetrate flesh and shake bones.
) . According to Black, those launches remind him of something: himself. "Did you know my guitar is like a rocket?" he asks. Show-business exaggeration? No. It's scientific fact. Black's guitar is like a rocket. "They both resonate," explains aerospace engineer Rodney Rocha of NASA's Johnson Space Center (JSC) in Houston. 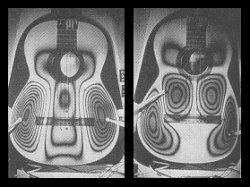 "When you pick up an acoustic guitar," Black demonstrates, "one of the first things you'll notice is the body is basically an air chamber. The shape of the chamber is designed to be 'in tune' with the sound from the strings." He plucks the E string and the body of the guitar vibrates, producing "sympathetic" E-frequencies of its own. 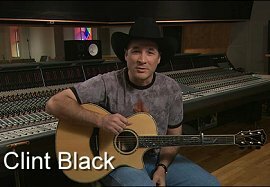 "We call this 'resonance' and it's a big part of what makes a great guitar," says Black. Resonance may be great for guitars, but "it can be disastrous for a spacecraft," notes Rocha. "When the shuttle lifts off, the main engines roar so loudly that a person standing near the pad would be killed—not by the heat of the exhaust, but by the sound of the engines," he says. The engines "strum" the spacecraft with incredible force. Rumbling sound waves penetrate the shuttle and its cargo, seeking, probing, shaking. "We cannot let these sounds [find] and over-excite a sympathetic resonance," says Rocha. If they do ... the sound is amplified, vibrations increase. Bolts can become unscrewed, covers ripped off, joints loosened. "It could really shake up your mission," laughs Black. The engines aren't the only source of sound. After liftoff, the rocket rips its way through the atmosphere en route to space. Rushing air creates strong aerodynamic noise, which rattles the ship. "You can hear this kind of noise by rolling down your car window while driving," Rocha says. Above: Guitars and shuttles both have chambers. Even in space, the noises don't stop. Vibrations can ripple through a spaceship when it docks with another ship, or when it fires its maneuvering thrusters. With each bump or thrust, the rocket is strummed anew. The goal of engineers, says Rocha, is to make sure these vibrations die out quickly, before they do any harm. In the language of musicians, "rocket designers must avoid sustain." When Black strums his guitar, the sound lasts a long time. "That's the sustain," he explains. Long-lasting vibrations are encouraged by the fabric of the guitar itself. "Notice how the guitar is made of lightweight, flexible wood—a material that likes to vibrate," points out Black. Rockets are made of stiffer, heavier materials, that damp resonances and reduce sustain. But that's not the only trick spacecraft designers use. Sometimes they modify the shape of the rocket, adding supports or filling in empty spots. The purpose: to detune the rocket from itself. Detuning rockets isn't easy because, as instruments, they're much more complicated than guitars. Consider this: A guitar is constructed from dozens of parts: tuning knobs, clamps, the sides and faces of the air chamber and, typically, six strings. The strings produce six fundamental frequencies: 82 Hz, 110 Hz, 147 Hz, 196 Hz, 247 Hz, 330 Hz corresponding to the open notes of E2, A2, D3, G3, B3, and E4. A typical rocket, on the other hand, is made of thousands of parts. The space shuttle famously contains more than a million components. All these pieces vibrating together produce a cacophony of frequencies ranging from subsonic waves that only an elephant could hear to high-pitched whines akin to fingers scratching a blackboard. Which frequencies might do the most damage? What parts of the spacecraft are most vulnerable to resonance? And how do you de-tune this complicated instrument? To answer these questions, NASA engineers have developed "sound studios" for spacecraft. "These are huge chambers where we take pieces of our rockets and expose them to loud noises." Really loud. "One of our 165 decibel acoustic horns at JSC can make as much noise as a space shuttle main engine," he says. By observing the response of "test articles" to the sounds, engineers can discover resonances and make changes to squelch them. "The most vulnerable articles tend to have low mass and lots of surface area—like a guitar," he notes. Acoustic testing has been a regular part of rocket design since the Apollo program four decades ago. "In those days," says Rocha, "NASA engineers blasted sections of Saturn rockets with loud sounds in special laboratories. And when the space shuttle came along we tested its components in the same way." Now NASA is preparing to build a new spaceship, the Crew Exploration Vehicle (CEV) to carry astronauts back to the Moon and on to Mars. "I'm sure the CEV will get its turn in a sound chamber, too," says Rocha. Who'd have guessed it? "Controlling your sound is just as important to rocket scientists as it is to musicians," marvels Black, strumming his guitar. If you listen carefully, you can hear the moonshot in the sustain. Hey wait a minute! What's all this about sounds in space? The context of this story is human spaceflight. So "even in space, the noises don't stop." There is air inside the spaceship to carry sound waves and ears to hear them. Airless robotic spaceships, on the other hand, won't make "noise," but they will vibrate and resonate. They're like guitars, too.